Super Deluxe Silmarillion published in 1982 by Allen & Unwin - $2000 A Fine example of the very hard to find Super Deluxe Collector's Edition. Red Leather, published in 1982 using first edition sheets from 1977, printed by Clows and Sons. Comes with a card signed by Chrisopher Tolkien! 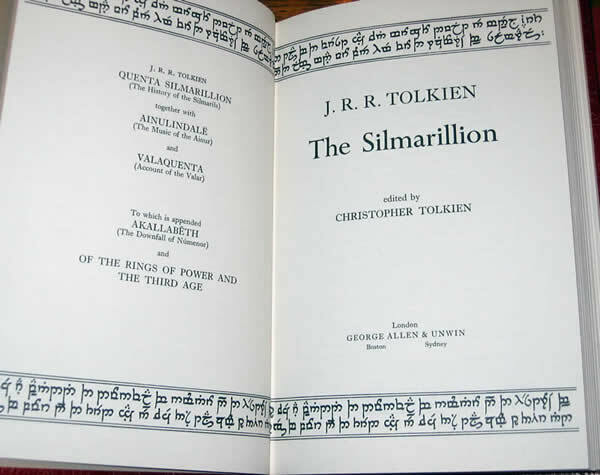 This is copy number 110 of the first one thousand copies off the press of the first edition of The Silmarillion by J.R.R. Tolkien reserved for later publication in this collector's edition. A Fine example of the very hard to find Super Deluxe Collector's Edition. Collected and edited by Christopher Tolkien after his fathers death. Original publishers full red leather binding, with cloth and leather slipcase, as issued. The book features red silk ribbon marker bound in, raised bands and gilt stamped Title, Author, and Publisher on the spine. This book has ISBN 0048232238. The front boards features the JRRT Monogram gilt stamped in single ruled box. 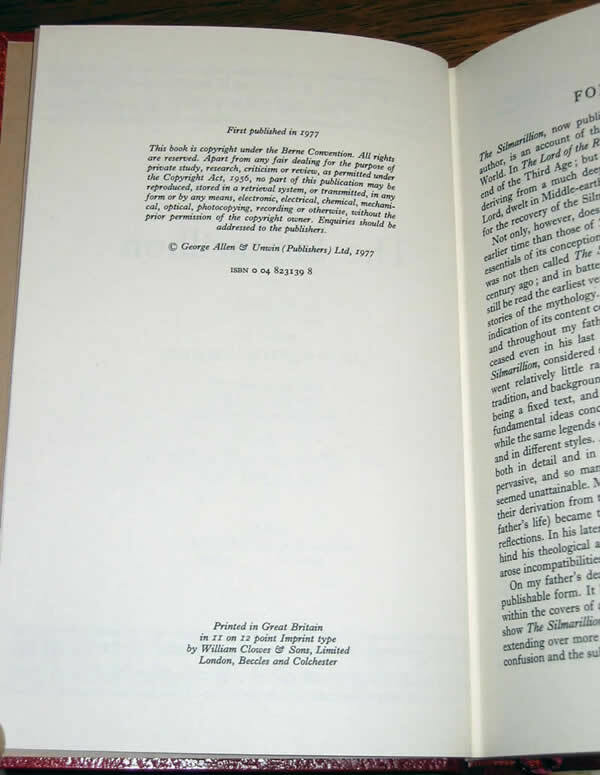 On the first free endpaper, the Publisher's Limitation Plate, gives the Limitation number of 110 of 1000. Limited edition of 1000 copies, 100 of which were signed by Christopher Tolkien. The first 1000 copies of the first edition off the press rebound in red leather. It is rumoured that not all of the 1000 copies were bound and issued. Comes with a little paper signed by Christopher Tolkien. This comes from the Tolkien Centenary Conference which was held in Keble College, Oxford in 1992. A striking example of a very hard to find book. This is a once in a lifetime opportunity to obtain a very unique collector item.